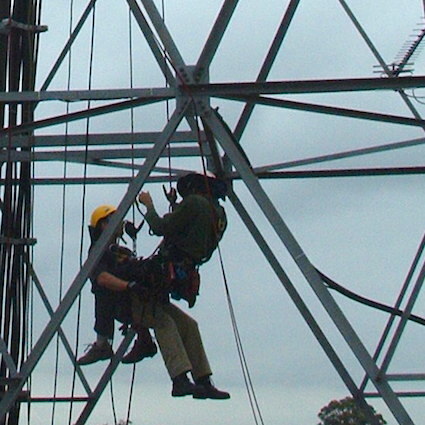 The Tower Climbing & Rescue training course is a two day (16 hour) introductory course covering one of the more advanced sectors of industrial work at height and height safety. If you require a standard height safety course for working at heights, please see either our Working at Heights course for industrial situations, or our Height Safety Training for Natural Surfaces course if you work on cliff faces or steep embankments. 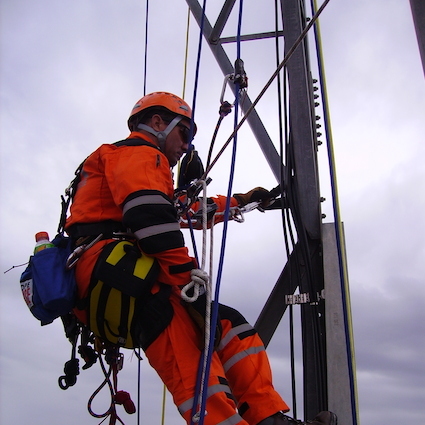 Modern steel truss towers and masts used for communications, ropeways, high voltage power lines and a host of other tasks present significant issues to the worker who must ascend them and, in the event of mishap, rescue or be rescued from them. Our tower training is contextualized to the student’s place of work and job focus. The main aim of the program is to be as relevant to the student’s tower climbing requirements as possible, with systems and protocols that are specific to their everyday situation. Dealing with some emergencies (suspended operators on lanyards) and safe use of portable ladders. If you represent a group and would like the flexibility of requesting your own training date(s) and/or location(s) then please send us your details via the Course Enquiry form below or you can contact us by email or phone (02 4784 2224). However, if you are an individual or are happy to join a public course, then our next public Tower Climbing course is scheduled for the 20th and 21st of June 2019. You can book on this course by completing the course enquiry form below. Minimum course numbers are required for the course, but as soon as we receive your booking or enquiry we’ll get in touch with you with a course confirmation or otherwise. Please note that if you are already qualified to climb towers, you may just want to just particpate in the second day of this course which is also known as the Tower Rescue training course. This is the ideal course for those needing to refresh their qualification. A recently attained Working at Heights qualification. All equipment required to undertake training.